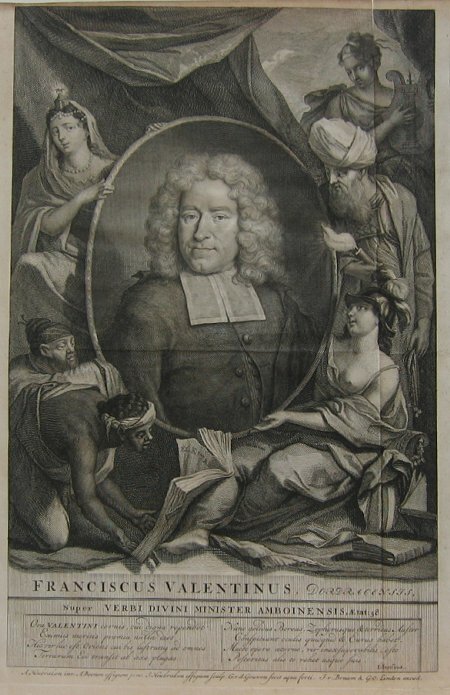 Important historian of the Dutch East India Company [V.O.C], best known for his encyclopaedic illustrated account of the Dutch trading Empire in Asia, Oud en Nieuw Oost Indien [Amsterdam 1724-1726]. Born in Dordrecht in April 1666, Valentyn studied theology and travelled twice to the East Indies. He was Calvinist Minister on the Spice Island of Amboina 1686-1694; between 1695-1705 he returned to the Netherlands; his second voyage East took him to Java in 1706 from whence he returned for a second time to Amboina 1707-1713. In the preparation of his Oud en Nieuw Oost Indien Valentyn was given privileged access to the hitherto secret archives of the Dutch East India Company which enabled him to provide transcripts and copies of important earlier 17th Century Dutch voyages, accounts, charts and engravings. Amongst these were accounts, charts and illustrations of Abel Tasman's Australasian voyages 1642-44 and the mid 17th Century manuscript charts and views of Johannes Vingboons.